IDF pauses after six counter-terror airstrikes. ‘We’re weighing our next steps,’ commander says. A senior IDF commander spoke Tuesday evening about the fatal terrorist shooting near Gaza earlier in the day, and the IDF’s expected response. A Gazan terrorist shot and killed 22-year-old Salah Abu-Latif of Rahat, a civilian IDF employee who was working on repairs to the Gaza security fence. The IDF views the incident as particularly serious due to the fact that Latif was murdered in Israeli territory, the commander said. 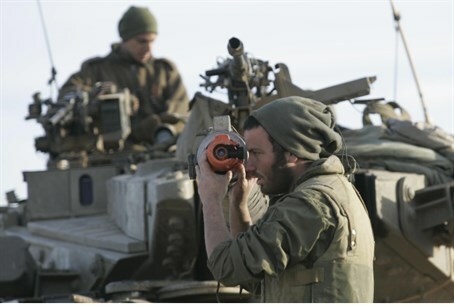 The IDF has been active in the Gaza region since Tuesday afternoon, he said. During the afternoon the IDF hit six targets in Gaza linked to terrorist groups. “The targets we attacked belong to the Islamic Jihad and Hamas,” the commander said. Sources in Gaza say at least two people were killed in the strikes, one of them a child. Now, the commander said, “we are considering our next steps.” The IDF “is extremely prepared for any scenario that develops,” he declared. The last major counter-terror operation in Gaza was Operation Pillar of Defense (Amud Anan) in late 2012. Pillar of Defense followed a massive rocket barrage on Israeli civilian communities, coupled with attacks on IDF soldiers within Israel. Following today's violence, Defense Minister Moshe Yaalon stressed that Israel held Gaza's Islamist rulers responsible for violence emanating from the territory under its control. "I advise Hamas to not test our patience," he said in a statement, warning that "If there won't be quiet in Israel, there won't be quiet in Gaza either." Meanwhile, a statement from Hamas, which does not recognize Israel and is committed to the destruction of the Jewish state, declared that "the occupier and its raids will not deter or stop the resistance." Tuesday's violence caps five days of terrorist attacks, beginning with clashes between IDF forces and Gaza-based terrorists on Friday and Saturday. On Sunday, terrorists detonated a bomb on a passenger bus in the central city of Bat Yam; and yesterday afternoon a police officer was stabbed and seriously wounded by an Arab terrorist just north of Jerusalem. Statistics released Monday revealed an alarming correlation between the recent dramatic rise in terrorist attacks and the resumption of US-sponsored "peace talks" between Israel and the Palestinian Authority.